Tips To Prevent Burglars From Cutting Your Phone Line | Calgary Alarm Inc.
You and your family are much safer with a home security system and even more safe with a 24-hour monitoring system, but burglars are commonly professionals who have a repertoire of ways to break into your home. One of the ways they can do this is by rendering your security system useless by cutting your phone line and modem line. In doing so, this stops the signal and the burglar is free to enter your home without the threat of emergency services being notified. In addition, it also prevents you from being able to call for help, or in some cases, even from using your cellphone if your data plan is connected to your home phone. However, the good news is that there are ways to prevent this from happening. A cellular backup monitoring service allows you to make calls regardless of whether your phone line is cut. It also allows you to still make calls in the event a burglar cuts off your power entirely or if the power goes out due to the weather. The majority of wireless alarm systems send signals through your cell phone, making it much more difficult for a burglar to attempt to stop them. If you don’t have a wireless alarm system, ensure that your alarm company sends a positive breach signal if the wire is cut. Also avoid getting an alarm system that will only notify you of a break and enter and requires you to call emergency services. Make your phone line difficult to access. Consider placing it high above your roof so that it will deter burglars from actually attempting to cut it. Also ensure that you don’t place the wire near any trees so that a potential burglar couldn’t climb the tree and then cut the phone line that way. 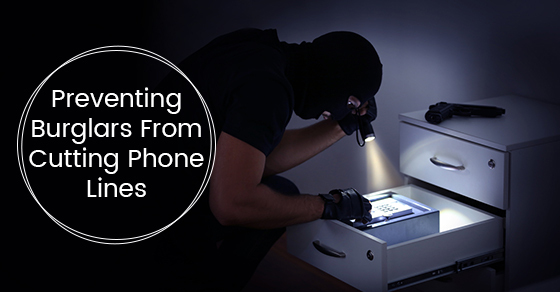 If a burglar is unable to snip your phone line easily, the chance that he or she will simply leave dramatically increases.